Everything you need to start playing straight out of the box! 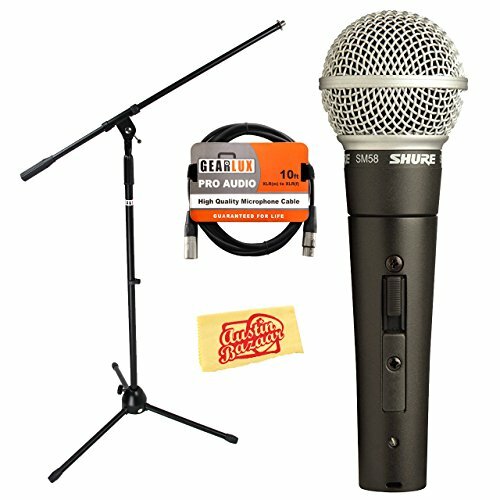 Bundle includes Shure SM58-S Vocal Cardioid Dynamic Microphone, Gear lux Boom Stand, XLR Cable, Windscreen, and Austin Bazaar Polishing Cloth. The legendary Shure SM58 vocal microphone is designed for professional vocal use in live performance, sound reinforcement, and studio recording. Its tailored vocal response for sound is a world standard for singing or speech. A highly effective, built-in spherical filter minimizes wind and breath "pop" noise. A unidirectional (cardioid) pickup pattern isolates the main sound source while minimizing unwanted background noise. Rugged construction, a proven shock-mount system, and a steel mesh grille ensure that even with rough handling, the SM58 will perform consistently, outdoors or indoors. You'll find multiple SM58s in most any studio or live music venue - no doubt you've heard of them. The SM58's frequency response is tailored for vocals, with brightened midrange and bass roll off. The uniform cardioid pickup pattern isolates the main sound source and minimizes background noise, which is ideal for vocals, especially in live situations where background noise is substantial. The microphone's pneumatic shock-mount system cuts down handling noise, making it a great choice for handheld vocals, and the built-in wind/pop filter helps keep things in check. The dark gray, enamel-painted, die-cast metal case has legendary looks and - paired with the mesh grille - legendary toughness.